Funny thing is whenever I make a carrot cake and pass it to some of my Chinese friends or colleagues, they would immediately assume it would be a Chinese carrot cake - the kind that uses white radish and is steamed. I guess they are more used to eating this version as compared with the Western carrot cake that uses the carrots that Bugs Bunny would eat! Honestly I like both! 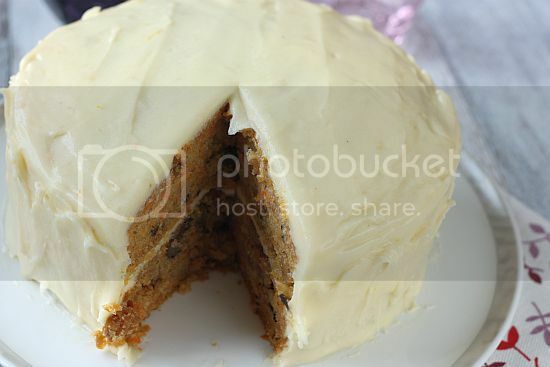 There are so many different Western carrot cake recipes out there and in fact I have posted a few already in this blog. I found this recipe from Joy of Baking and have in fact made this three times already. 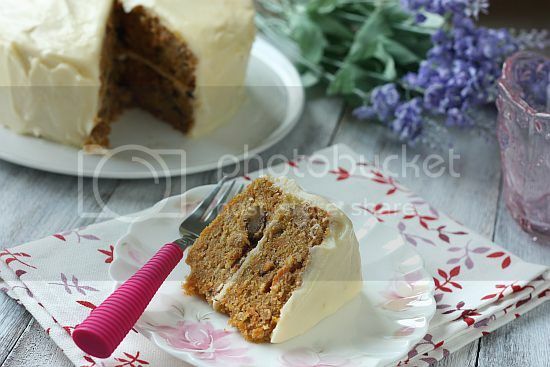 Carrot cakes are extremely moist and full of texture, some recipes even using crushed pineapple. I thought this sounded more of a Hummingbird Cake rather than a carrot cake. 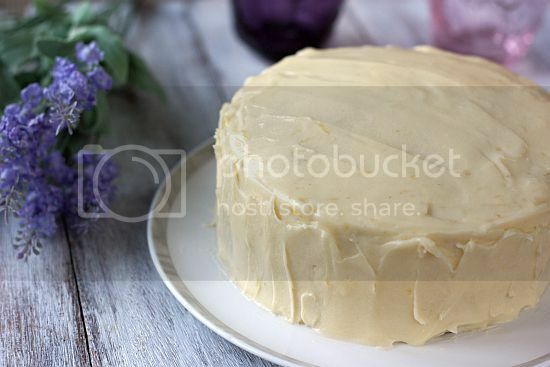 This particular recipe deviates from most carrot cake recipes I have come across as it required you to beat the eggs and sugar, similar to a chiffon sponge. The cream cheese frosting is to die for as well. All I can say is that I am definitely going to make this recipe again .... maybe sooner than you think! 1)Preheat oven to 350 degrees F (180 degrees C) and place rack in ceor spray two - 9 x 2 inch (23 x 5 cm) cake pans and line the bottoms of the pans with parchment paper. 2) In a bowl whisk together the flour, baking soda, baking powder, salt, and ground cinnamon. 3) In a separate bowl beat the eggs until frothy (about 1 minute). Gradually add in the sugar and beat until the batter is thick and light colored (about 3 - 4 minutes). Add the oil in a steady stream and then beat in the vanilla extract. 4) Add the flour mixture and beat just until incorporated, scrapping down the bowl at least once during the mixing. 5) Then add in the nuts, followed by the grated carrots and fold until it is mixed into the batter. 6) Divide the batter evenly into the two pans and bake for about 25 to 30 minutes or until a toothpick inserted in the center comes out clean. 7) Remove from oven and let cool on a wire rack. After about 10 minutes invert the cakes onto the wire rack, remove the pans and parchment paper, and then cool completely before frosting. 8) To assemble: place one cake layer onto your serving plate. Spread with about half the frosting. Gently place the other cake onto the frosting and spread the rest of the frosting over the top of the cake. If desired, garnish with toasted nuts on the top of the cake. Cover and refrigerate any leftovers. In bowl of electric mixer (or with a hand mixer), beat the cream cheese and butter, on low speed, just until blended with no lumps. Gradually add the sifted powdered sugar and beat, on low speed, until fully incorporated and smooth. Beat in the vanilla extract, and lemon zest. 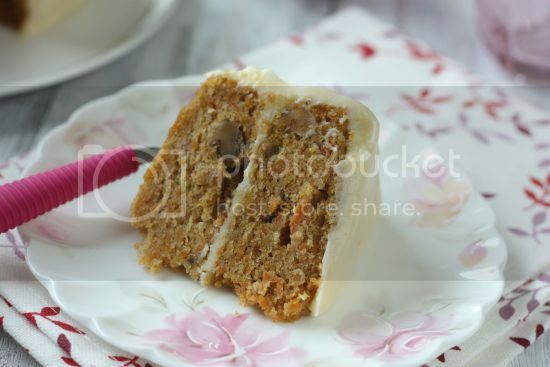 This carrot cake looks very delicious. Yum! This is one of those things that I never get tired of. I always enjoy Carrot Cake. I remembered one year, I brought a carrot cake for my FIL's birthday, my CHINESE sister in law thought it is FATT kueh. Now I wonder where that comes from. haiz. Haha, Edith. I wonder too! I can understand if it was "lobak gau". Tea time here...wish I could have a large slice! Hi all, thanks for dropping by. And yes, carrot cake is a classic one that's for sure. Edith, fatt guah and loh bak gau are so far apart. How can they mix it up?? Shirley, Anne, I like both actually. Looks very moist and tasty. I love to visit and see what you have been up to. 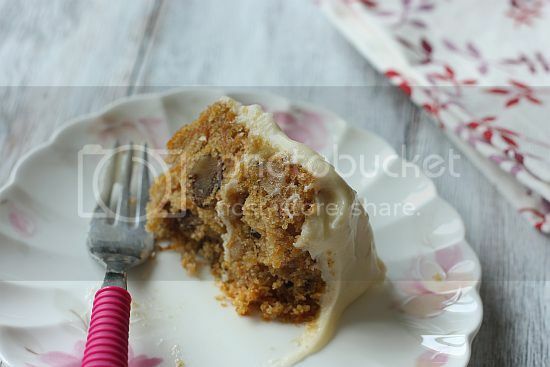 this is a nice nutty chunky cake! I love carrot cakes too and I happen to make two recently. I do agree that using crushed pineapples and desscicated coconut do seem like making of hummingbird cakes.